Jochen Langbein, of Taunton Athletic Club, a club which my daughter, Isla, belonged to, having read my post on Ironman, mentioned to me the fact that the very first Half Ironman, Ironman 70.3, was put on in the UK, at the Ironman Qualifier site on Exmoor at the incredibly beautiful Wimbleball Lake. So I thought I would write a post about it to celebrate this fantastic event and to suggest that you go and spectate – it is the most stunning location, and the next event there is Ironman 70.3 on 16th June….put it in your diary! 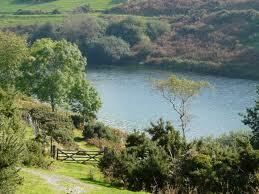 The very first 70.3 race to ever exist in the world was in the UK – the Ironman 70.3 at Wimbleball Lake on Exmoor. This event has now taken on an iconic status, as do all Ironmans, and fills to capacity every year. Age Group athletes can qualify from this race for the Lake Las Vegas Ironman World Championships 70.3. You can download a programme that will tell you everything you need to know, starting with the race day schedule. You will learn that Lake Wimbleball has been nominated to be the first Dark Skies Discovery Site on Exmoor and that Exmoor National Park has been designated an International Dark Sky Reserve, the first place in Europe to achieve this prestigious award. It’ll also tell you that a downside is that you shouldn’t expect to get a mobile signal here! I learned that Nirvana Europe is the Official IRONMAN Europe Travel Agent and that they have been moving UK athletes and their bikes to major triathlon and duathlon events, all over the world since 2002. In 2013 they will cater for the travel and accommodation requirements of almost 1,250 athletes travelling to IRONMAN and IRONMAN 70.3 events in Europe, Australia and North and South America. Nirvana are hot on logistics… they know the locations, know the people involved and put in place the most comprehensive race related logistics plan you could hope for if you wish to compete. I also learned you can book to have a pre- and post-race massage. That’s mandatory in my book!